Items that the Capital Area District Libraries have made available for checkout. To some, libraries are good for only a handful of things. Quiet studying, checking out the latest book of choice, and doing hard research are a few that come to mind. But Capital Area District Libraries has a different philosophy on what a library should be to a community; this is demonstrated in one of its newest ventures, the Library of Things. 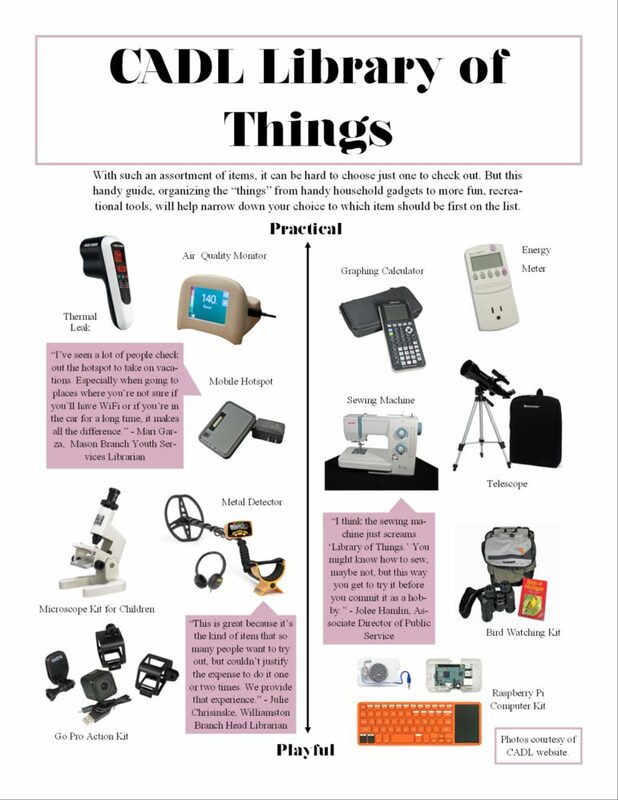 CADL wanted to provide a service that would let people try out equipment such as microscopes, air quality monitors and metal detectors without having to take on the financial burden of purchasing them first-hand. Associate Director of Public Service Jolee Hamlin said the idea came from a library in Sacramento, California. “I’m always trying to watch trends in library land. When I saw a few libraries around the country trying this thing, I thought ‘you know, we better give that a try,’” said Hamlin. Choosing was hard, but the heads of the project chose to focus on a mix of useful and entertaining items. The reception, so far, has been overwhelmingly positive, said Hamlin. All of the 12 items available from CADL have holds, and a few have several people in the queue. “It has been just outstanding. Our patrons are so excited about this service, and you can see it when they come in to pick up their items,” said Mari Garza, a youth services librarian at CADL’s Mason branch. Hamlin said CADL would like to keep expanding its Library of Things in 2017. “We’ve had several suggestions for new things to add. The craziest has probably been paranormal activity hunting gear. But really, we’re probably looking at more like gaming consoles, a VHS to DVD converter, and things like that,” said Hamlin. Julie Chrisinske, head librarian at CADL’s Williamston branch, is excited to watch this service move forward. “It’s a wonderful and exciting service that we’re providing. It makes people in the community look at the library in a different way. I can’t wait to see what items we bring in next, and how they will serve our CADL patrons,” said Chrisinske. Lexi Groce is a journalism and documentary production student at Michigan State University. She plans on becoming a travel journalist, and also enjoys filming and taking photographs. Honor for All, a non-profit organization with roots in Williamston seeking to erase the stigma surrounding post-traumatic stress, has made national strides in bringing awareness to the damage of recognizing this commonality as a weakness and disorder. The group is pushing to change the term post-traumatic stress disorder to the less damaging post-traumatic stress injury.